Multi‑band active global navigation satellite system (GNSS) antennae are tailored specifically to the needs of applications requiring centimetre-level positioning accuracies for high precision applications, says u-blox at the launch of its ANN-MB antennae. ANN-MB offers product designers an attractively priced, easy-to-implement, and reliable multi-band antenna solution, claims the company. Developed in conjunction with the u‑blox F9 multi-band high precision positioning platform, ANN‑MB receives signals on the L1 and L2/L5 bands of all four global navigation satellite constellations (GPS, GLONASS, Galileo, and BeiDou). The antenna features versatile mounting and connector options (SMA, SMB, MCX) and supports an extended temperature range (up to 105 degree C), making it suitable for applications subject to extreme temperatures. 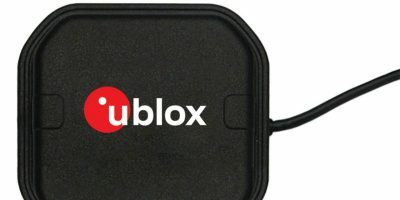 u-blox claims that its price-performance ratio and ease of installation make it suitable for small to medium size customers with little experience with GNSS antennae, and yet want to accelerate time to market. A limited amount of ANN-MB-00 (SMA) prototypes are available now, and production of the ANN-MB series is planned for December 2018.
u‑blox provides positioning and wireless communication technologies for the automotive, industrial, and consumer markets for people, vehicles, and machines to determine their precise position and communicate wirelessly over cellular and short range networks. Its portfolio of chips, modules, and a growing ecosystem of product supporting data services are intended for the internet of things (IoT).